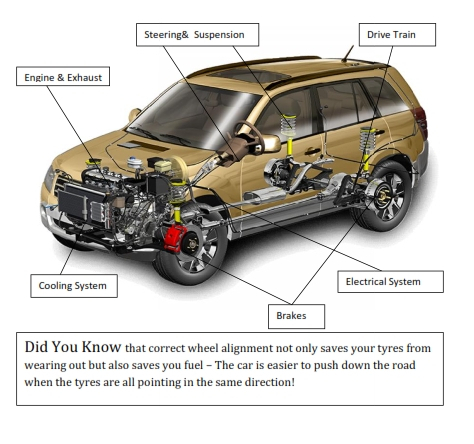 Servicing your vehicle regularly is important for the long life of the vehicle. There is a misconception amongst vehicle owner’s that when you bring your vehicle in for a standard service that everything front to back will be attended to. This is not so. A service (Oil and Grease) in this country is generally just an engine service and a check on the oil or fluid levels in other components. With so many different types of vehicle on New Zealand roads it is impossible to know exactly what is the service schedule for each. Added to this many of them have been imported from Japan with no service history at all. Owners will also move from workshop to workshop and not bring any service history except for any stickers that have been put on the vehicle. The result of this is that in over 95% of cases there is an incomplete service history for the car that we are working on. We are moving from our Perventative maintenance Report sheet to a Digital Vehicle Inspection. See opposite for the DVI or below for the paper based system This report is done for all of our customers that come in for a WOF or Service. Checks performed are – Click to read more. If it needs the Cambelt Changed. The technician will look at each item on the report sheet and either make an assessment of the condition of the various oils or use test gear to determine if the fluid or component is in acceptable condition. To Book online or request further information CLICK HERE and we will get back to you. We are in the process of changing over our Paper based check sheet above to a digital report which will be able to be discussed with you after any WOF or Service and also be emailed direct to you. These inspection reports are very comprehensive and also contain photos of any areas of concern. The Technology has just been imported from the USA and we are in the progress of converting links it provides to New Zealand sites. We will always try to speak to the customer about our findings and give our advice. We never employ hard sell practices. We always tell the owner what it would cost and leave the decision up to them to decide if they would like it done.